"Wilderness Cascade" Bald River Gorge Wilderness, Cherokee National Forest, TN. Canon 7D, Sigma 70-300mm f/4-5.6 DG APO lens, 1/5 second, f/22, ISO 100, two shot panorama on tripod. For today's behind the image, I thought I'd take a look at one of my images from my spring "Smallest Wilderness" project trip to Tennessee. These smaller cascades were upstream of the ninety foot Bald River Falls on the edge of the beautiful Bald River Gorge Wilderness. First, let's start with my compositional intentions. I wanted to capture a somewhat abstract image that illustrated the beauty of the patterns in the falling water and dark underlying rock, without providing other grounding or contextual elements on the shoreline. I was particularly drawn to the distinct curvilinear lines of the steep drops framing the roiling and chaotic drop pool and shallower cascades in the middle. I knew that I wanted to render the water with a silky texture, while maintaining enough detail to make out individual lines of current and to preserve the jagged texture of the underlying rock in the foreground. A deep final drop pool, fast current, and the nearby ninety foot drop precluded getting into the river, so my only choice was to shoot from the very tip of an overhanging rock ledge. Leafless branches sticking out into the river and the far shoreline meant that I needed to zoom in quite a bit to maintain a clean composition. You may have heard the axiom to "never shoot at f/22". Why? Because lens diffraction reduces the overall sharpness of the image. This is a good general rule to follow. Yet, as you can see from the caption above, I did just that (and frequently do in my nature photography). You now might be rightfully asking yourself, "why?" In most cases, it has to do with the fact that depth of field is paramount for the particular image I'm making (most often macro) and more important than the slight edge in overall sharpness. More often than not in these situations, conditions such as a moving or changing subject, wind, rapidly changing light, etc... also preclude an attempt at focus stacking. For this particular image, several factors were in play. First, zoomed into about 140mm (x1.6 crop factor makes an effective length of 224mm) and being relatively close to the cascade, depth of field became crucial in capturing detail in the foreground cascade and the deceptively relatively distant background cascade. This was important to establish the framing effect that I wanted and keeping the abstract nature of the image. Focus stacking wasn't feasible in this case because of the ever shifting lines of the current. 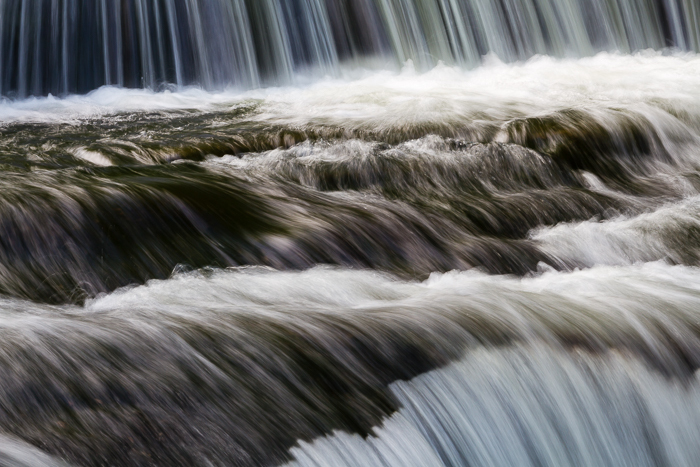 Second, I needed to lower my shutter speed enough to get the required silkiness in the water. 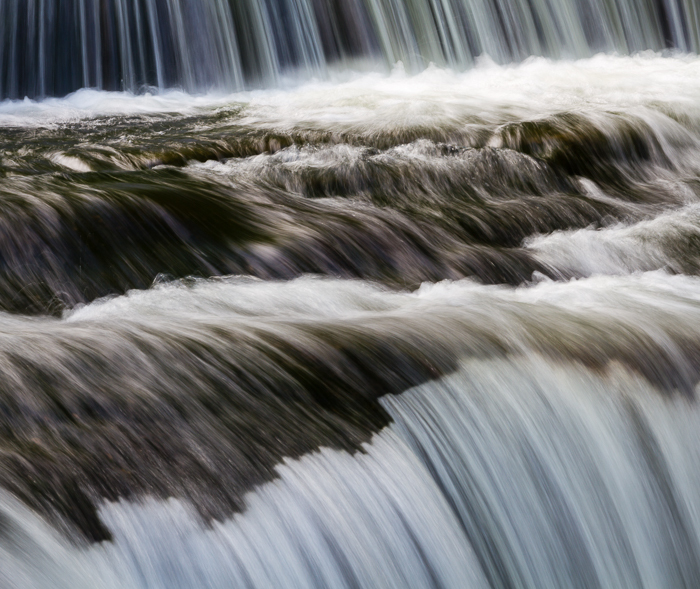 Finally, I knew that by rendering the water as a blurred, silky flow, absolute crisp sharpness was not going to be an absolute requirement for this particular photograph. It turned out that at the level of zoom required to crop out the bare, out of focus, branches poking in from the sides, I couldn't fully get both the bottom of the background steep drop and the foreground steep drop in the frame at the same time. So I took the two following frames. Unfortunately, being a fairly abstract image, there weren't enough reference points for either Lightroom or Photoshop to automatically stitch the two images above together properly. So I brought both images into Photoshop as different layers. I used "Auto-Align Layers" to get the layers roughly lined up and then changed the opacity of the top layer to 50% and used the move tool to line up the pattern of the jagged rock in the foreground as accurately as possible. 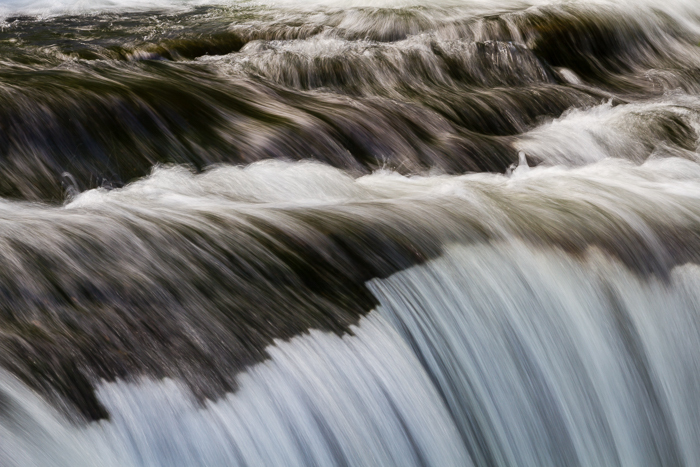 Even then, the ever-changing lines of flow in the foreground had changed enough in between images (and due to the perspective shift) that the lines would not line up if I blended in the middle of the bottom falls. Leaving a very obvious seam. I realized, however, that if I blended the two layers right at the bottom fall line (at the top of the jagged rock), then the blend was invisible. I used the graduated tool to draw a very short transition between white and black on the layer mask for the top layer, blending the two images together seamlessly. Then it was just a matter of cropping off the horizontal mismatch in the edges of the frame. Finally, I made standard processing adjustments to the RAW file in Lightroom. I adjusted the Exposure, Whites, Highlights, and Blacks sliders for contrast and maintaining a proper level of detail in the whitewater. I adjusted Clarity and Vibrance and added an additional Medium Contrast curve for added impact. I corrected for the lens used and more importantly chromatic aberration. I added a slight amount of noise reduction and some slight capture sharpening. Because of the abstract nature of the subject and the already dark rock and water, I only added a slight amount of vignetting to hold the viewers eye, without being obvious.